This light baked French toast will change your brunch game. Everything doesn’t have to be decadent at brunch. Sure, serve your mimosas and bloody marys but try to include some 100% whole grain sprouted bread. If you serve enough drinks, no one will notice the healthy bread! 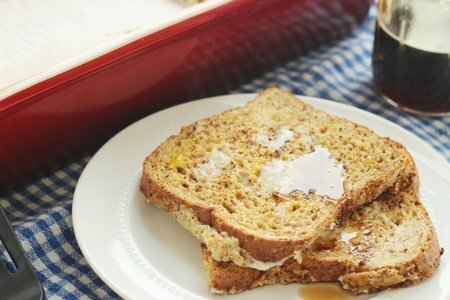 I love the concept of baked French toast because you don’t have to stand around the kitchen flipping bread in a pan. Just toss it in the oven and remember it when the timer rings. Also, it is “baked” which makes it like a baked good and that always makes my family happy. I have been looking for healthier bread and posted about some of my finds in bread with no added sugar. It turns out that the sprouted bread that I found is great for French toast! I would not call it “fluffy” but I would call it tasty. 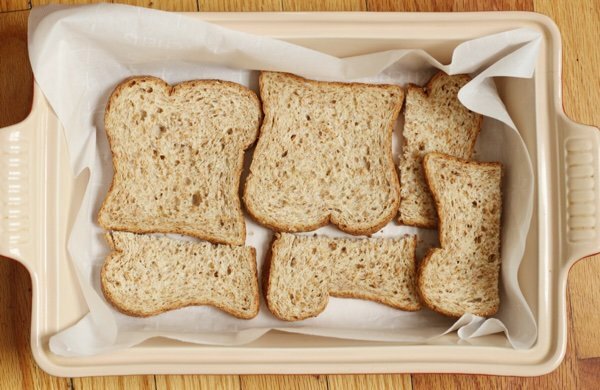 This is the kind of dish that kids will eat without even noticing that you pushed whole wheat bread on them. My kids complain all the time that they can’t get me to serve them white bread. When you make this, be sure to use parchment paper to line the casserole. Using paper helps you in clean up and you don’t have to butter the dish. This can be set up the night before and then popped into the oven if you prefer. Also, you can make a couple of trays of it and freeze the French toast into “sticks” that kids will devour. I like piling cut fruit on top of this for a more luxurious breakfast and topping it with yogurt. Try my healthier pancake topping If you must have syrup. You can even serve this for dinner – why not? It is really only eggs and bread. Add a salad and you got dinner. 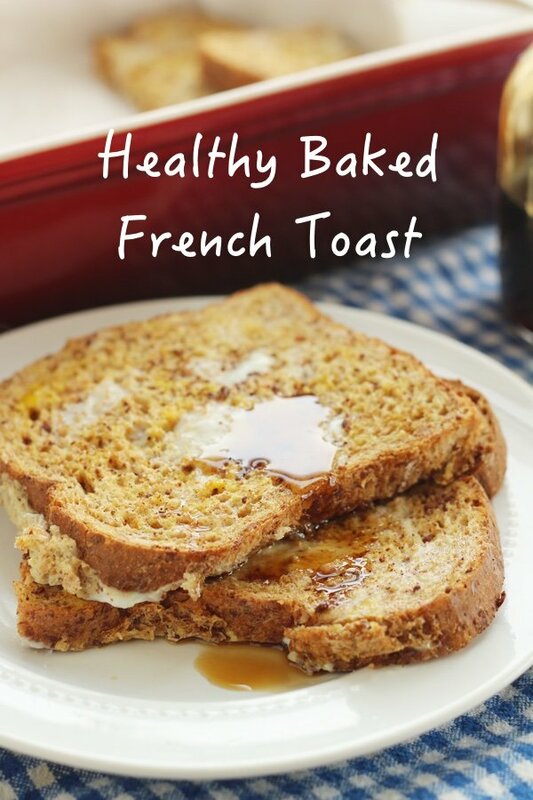 Do you make baked French toast? How do you make it? Heat oven to 400 F. Line a casserole with parchment paper. Place bread slices flat in casserole. 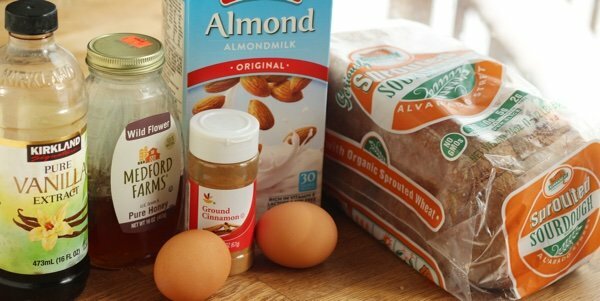 Whisk eggs, almond milk, vanilla, honey, and cinnamon in a medium bowl and pour over all the bread, soaking it. Leave it for 10 minutes and bake for 15-20 minutes until the bread is browned. Enjoy with yogurt, fruit, or a little syrup. $12.00 for a loaf of bread+$9.00 shipping? No thanks! Those were just a couple of examples. Why don't you shop around? Lots of people want me to do it for them. Your welcome. If you belong to Amazon Prime you don't need to pay shipping on Prime products, btw. What is your health worth? result. Not having had french toast at all this year, you've inspired me to look up egg replacers, I'll give it a go next weekend when I'm having overnight company. Thanks Lisa! Barbl - Why would you substitute eggs? Are you allergic? Eggs are the new health food. They are also low in calories. Look up nutrition in whole eggs. Take note of the selenium content (110%). Selenium protects against cancer and viruses. In addition, there is 24% vitamin A, 56% B 12, 17% B6 which is protection for the heart, and loads of others. The yolk in particular has a lot of vitamins and protein. According to my doctor and medical reports, cholesterol is determined through genetics primarily. I eat sometimes 2 or more eggs a day. I am a 67 year old diabetic and my labs are great. "The findings suggest that a high-cholesterol diet or frequent consumption of eggs do not increase the risk of cardiovascular diseases even in persons who are genetically predisposed to a greater effect of dietary cholesterol on serum cholesterol levels." What increases the risk of heart disease for diabetics are carbs. IFortuna-Hi, I'm 6 months now living as vegan as possible. I'm eating better, my body is more regular, and I feel great. I'm convinced that Drs Esselstyne, Barnard, Greger, Caldwell, et al, are leading experts on the latest health research. However I'm keeping an open mind and will make tweaks as science goes forward with changing data. I appreciate your findings and always enjoy your comments on your diabetic eating advice. I always believed eating a diabetic diet was very wise. At nearly 70 yrs, I count myself lucky that I didn’t get diabetes. Most of the doctors mentioned above have excellent youtube video lectures which I binge-watch occasionally to stay my course. I love this recent 5min clip of Dr Greger on a morning talk show, describing a day of healthy eating. And following that is his video about eggs and how they aren't healthy or safe. I think we are all just trying to do what we think is best. I wish you continued good health! sugars, refined starches, and sodium. Nutrient-dense foods include fruits and vegetables, traditional local crops (including neglected and underutilized species and wild foods), seafood, eggs, beans and peas, unsalted nuts and seeds, fish and animal-source foods (dairy products: eggs, fat-free and low-fat milk and milk products, and lean meats and poultry)—when prepared without solid fats or added sugars. " Also, one egg is only about a low 80 calories. My links are relevant because they are from accredited schools and medical sites. I suggest this article from The National Center for Biotechnology Information's library . It is a medical paper citing a multitude of doctors from all over the world and their research presented in this paper. There are over 111 references regarding this issue. Here is an article from Berkeley University citing evidence from Harvard University. I think it is very important to conclude that information we are looking at has medical research papers and university studies to back up that information and references cited. University of New Hampshire has this article which has an emphasis on macular degeneration. Lutein and zeaxanthin are key in its prevention and are contained in eggs. disease, most notably, the prevention of age-related macular degeneration (AMD) (Ribaya-Mercado et al. BarbL; The Grain Supplier Bob's Red Mill Claims That Flax Is A Substitute For Eggs (2 Tblspns. 1 Egg).